KTMtwins.com KTM Motorcycle and Product News: King of the KTM 950 Super Enduros! Imagine taking the front brakes off your bike and then going as fast as you can on a dirt road. Now if that isn't scary enough try throwing it sideways and breaking the rear wheel loose just so you can hold the turn. This is the life of flat trackers and we have huge amounts of respect for their riding ability. If you've never seen the sport do yourself a favor and find a race and experience it. 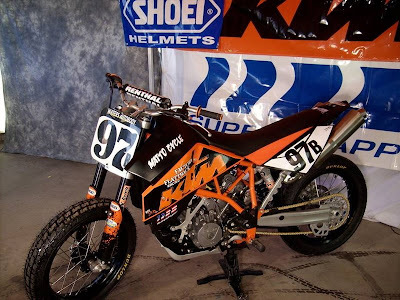 We had to showcase Team Project K Racing so that we could show off their ultra cool KTM 950 Super Enduro Flat Tracker. Keep up the good work guys and good luck in 2009.